Bathrooms tiles and floor tiles have been carefully chosen by our client. Neutral tones such as warm beige tones have created a clean and calm space, while the white marble effect tiles have brought some texture and definition to otherwise a boring bathroom. Featuring modern fixtures and fittings, we managed to tailor the bathrooms to suit the client's style preference, needs and budget. The simple design of the kitchens was meant to maximise the space in the room. 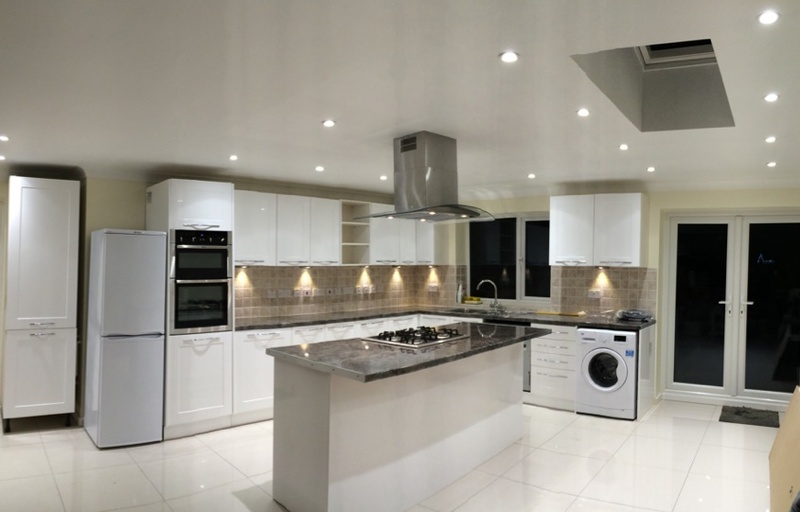 Classic white cabinets with grey granite worktops have been fitted to stand up the time without looking dated. The open plan kitchens are one of the most popular layouts, reflecting the need for greater sociability during meal preparation. Lofts conversions have completely transformed the space into large bedrooms with en suite bathrooms. Very bright because of the white painting, and the light coming through the windows, this space invites you to relax and unwind, that's why it was preferred by our client. 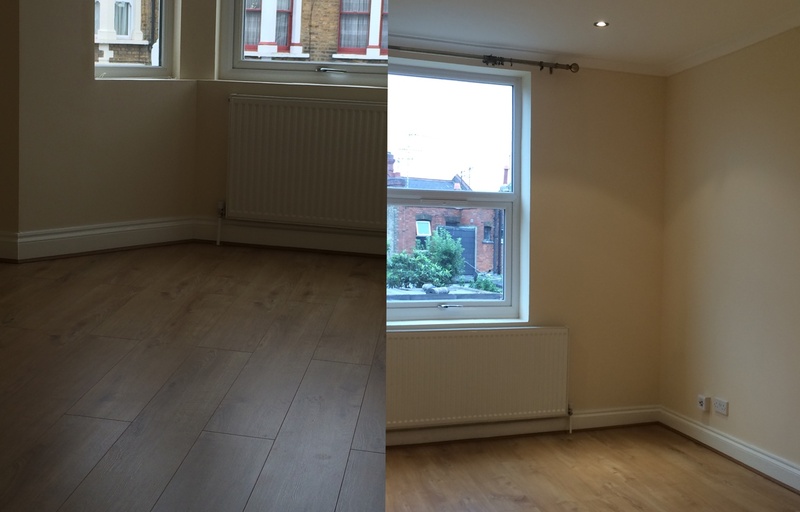 We have just completed another one of our projects, a duplex comprising of 4 luxury 2 beds and 2 bathrooms flats. Each apartment has got individual access to its own private garden. The market value of the two houses has been hugely increased by converting the lofts and building rear extensions. Redesigning kitchen Kitchen full upgrade included fixing new wall and floor tiles and fitting new, grey color kitchen units. The two coats of white paint bring luminosity and along with the minimalist design ensure a clean line for a flowing kitchen look. To enhance the ensuite bathroom, a feature panel in cappuccino beige mosaic glass tiles has been fitted on the wall between the shower and the toilet. The floor porcelain cream tiles have been carefully chosen to match the wall color scheme. 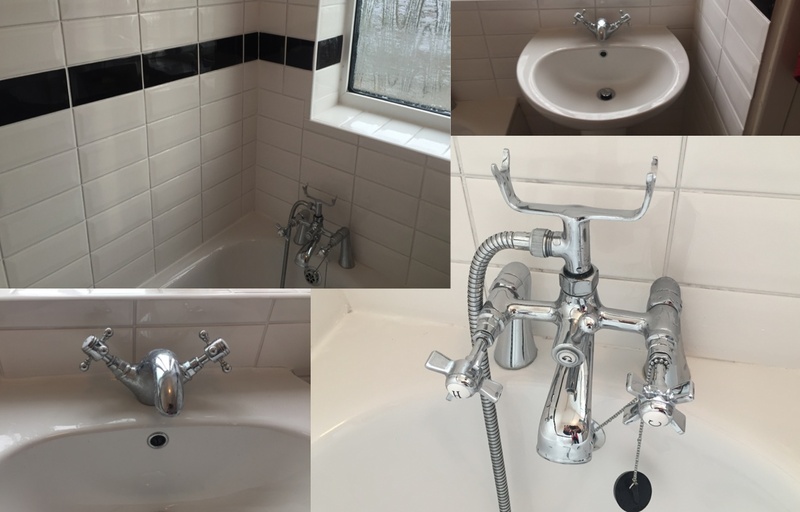 First foor bathroom had fitted white mosaic tiles with a contrast border in black, grey and white for a minimalistic look. All the house bathrooms have been completely refurbished. 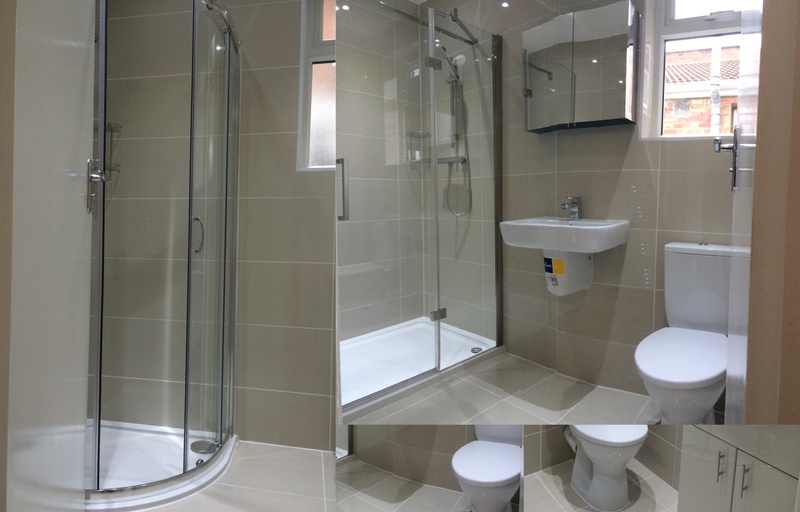 The ground floor bathroom had fitted a luxurious curved frameless walk-in shower. In order to create contrast, feature panels of wall capuccino beige mosaic glass tiles were mixed with stone effect tiles on a white background for a natural and elegant look at the same time. All bedrooms house have been redecorated and carpeted. The owner was impressed with the living room size, grace to the side and rear extensions. The loft of the house has been converted into a spacious room, a small hallway and an en -suite bathroom, in a white finish. All space has been fully carpeted by our team, ready for the owner's eldest son to move in. 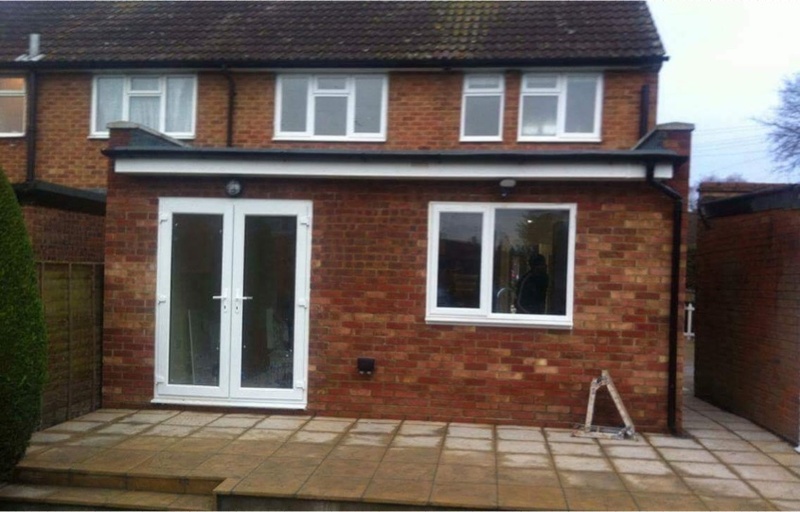 We have recently completed our project: two storey side extension and rear extension. The before and after pictures show clearly the improved image of the house and also the extended room which has been created. 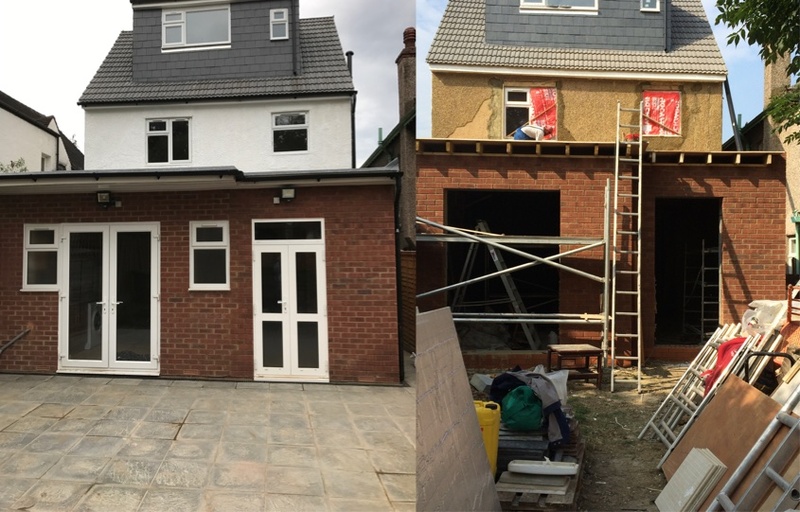 Our new building project in progress - two storey side extension, rear single extension, loft conversion and full house refurbishment. We have redesigned the bathroom, fixing new floor and wall tiles, adding a bath screen and installing new cabinets. 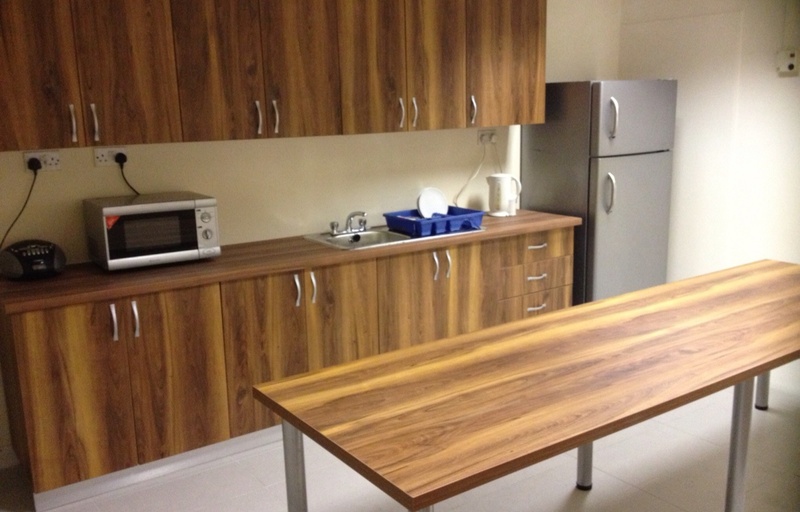 Kitchen complete makeover included fixing new cabinets and appliances, new wall and floor tiles. We fixed laminated wood floor in the living room. The carpet in the bedrooms has been carefully chosen along with matching curtains. New tenants can move in. The loft and the house bedrooms have been converted into spacious studio flats with fitted kitchenette and en suite shower room. Improve outer property appearance - Paving driveway, building new doorsteps, refurbishing porch area and building new brick fences to the sides, will not only transform your house exterior but also add extra value. 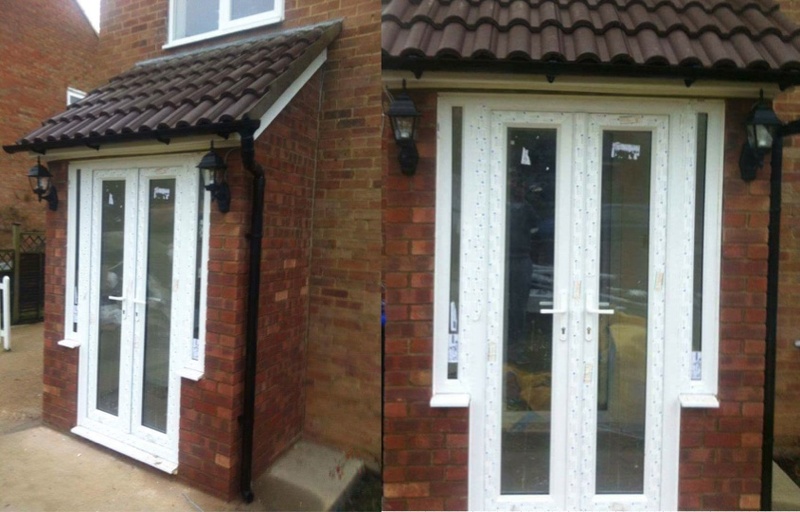 Refurbishing porch area - Fixing new tiles on the porch area and installing a new entrance door for our customer. Building a rear extension and paving the garden terrace - has enlarged the house space and gave a new style to the garden. 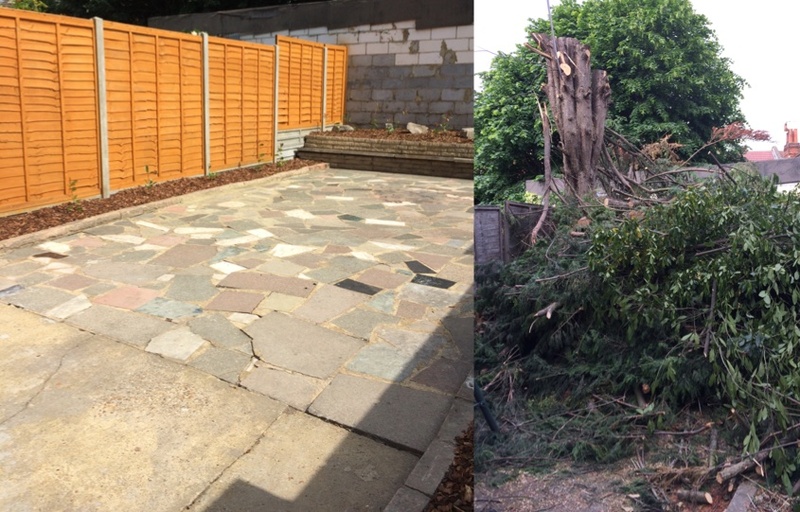 Customer wanted to remove a big tree from the back garden which was blocking the light out. We used our wood chipper in order to be able to remove it and redesign the garden. 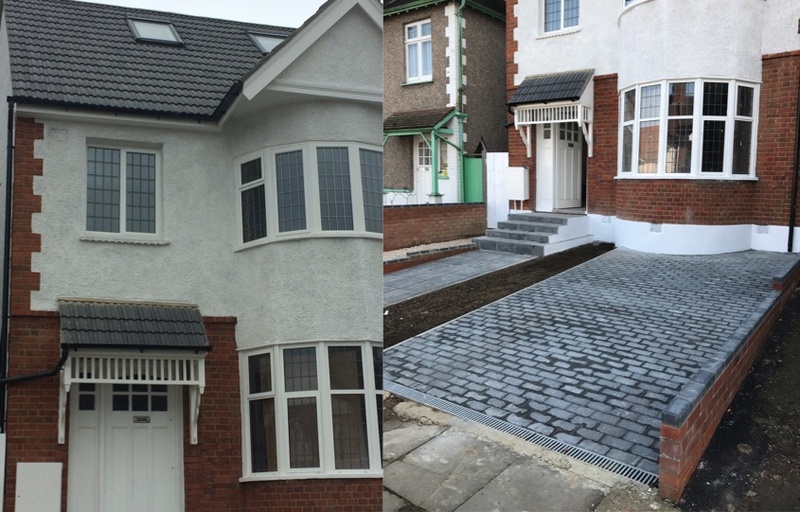 Building rear house extension and paving the garden terrace - the extension created ample space for a large kitchen. Complete kitchen upgrade - from tiling walls and floor to fixing new kitchen cabinets and appliances in order to deliver a fabulous kitchen. Bathroom shower installation cabinets and wash basins with tap installations to give a new look to the bathroom. 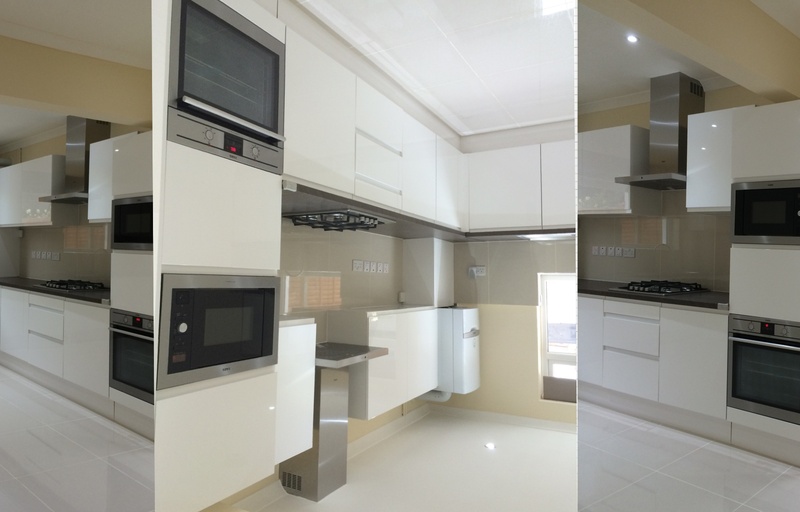 A complete kitchen makeover to bring it to the modern trends and safety standards. Redecorated full house with wooden floor and painting the walls. 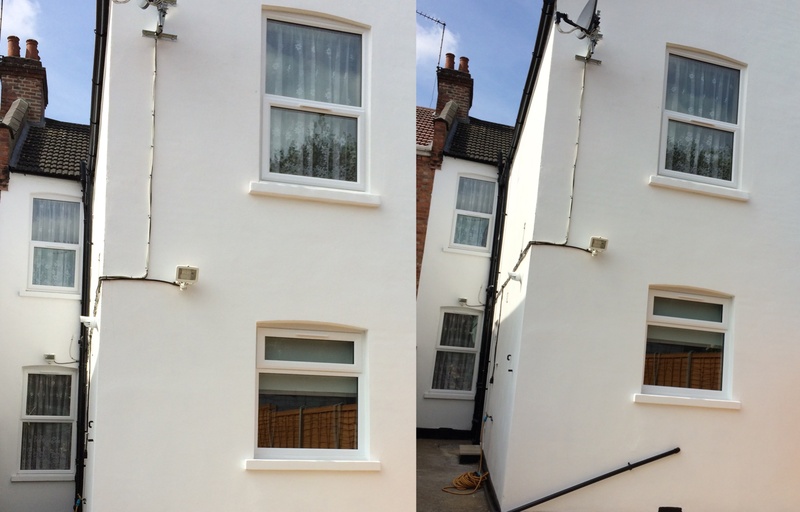 Applied a coat of coloured render over external wall and painted. Bathroom wall tile work shower installation and wash basins with tap installations to give a new look to the bathroom. 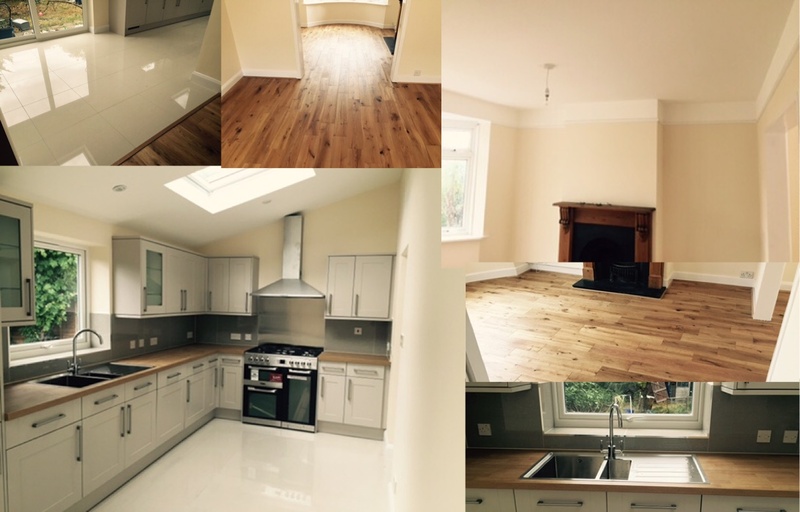 Full house renovation work with Wood Floor fixing, Kitchen Units Fixing, Tiling and bathroom refurbishment. 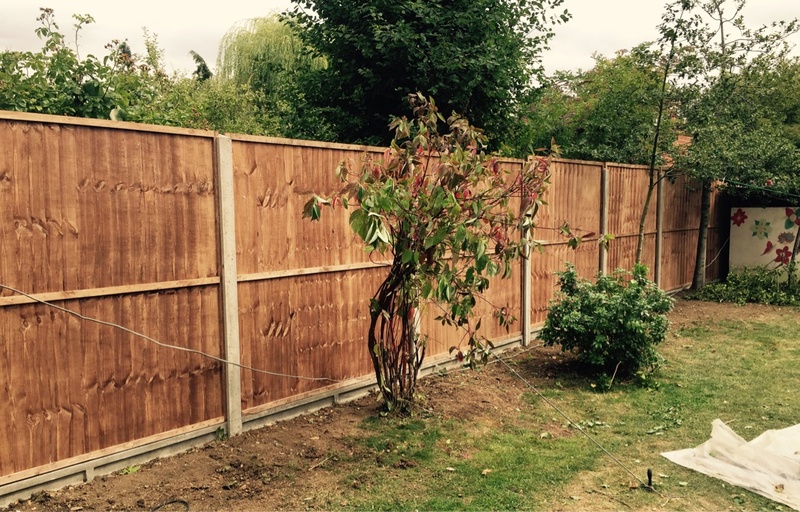 A rich, warm toned wooden privacy fence with layered slats worked with slotted posts and a waved Square Trellis top. 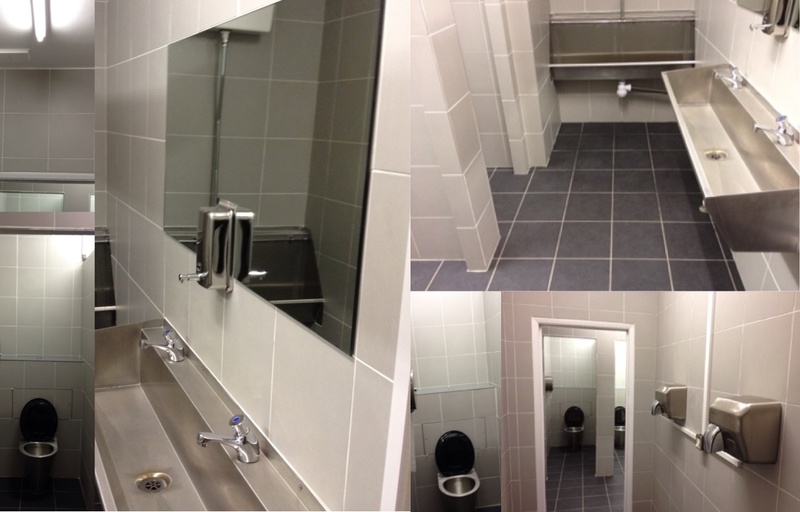 Fully refitted a commercial bathroom for staff & visitors with new tiling and cupboards. Fully refitted a commercial Kitchen for staff use with new toilets, urinal, sink and floor tiling. 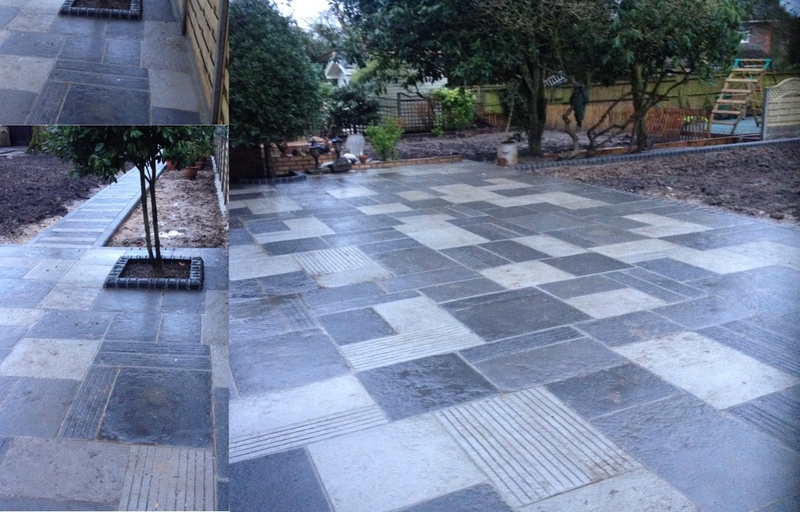 Natural Limestone garden paving with a split surface finish that gives a clear finish to the garden. 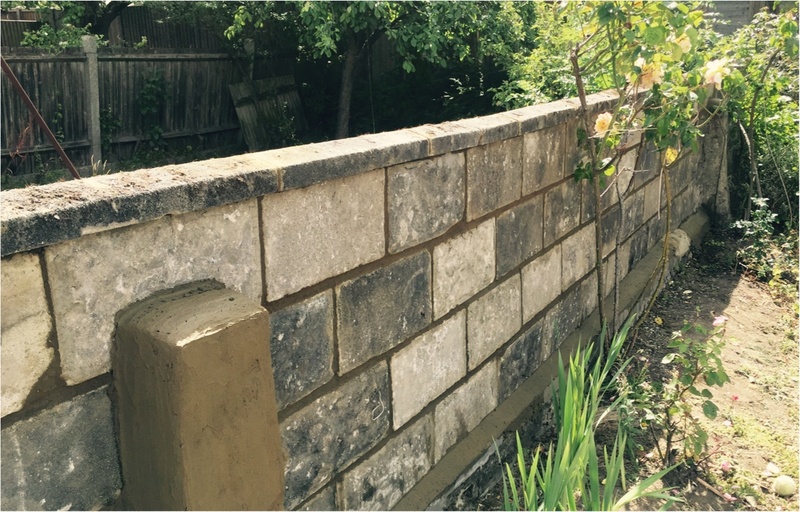 Customer wanted to rebuild a concrete wall fence for the garden and we delivered as requested. 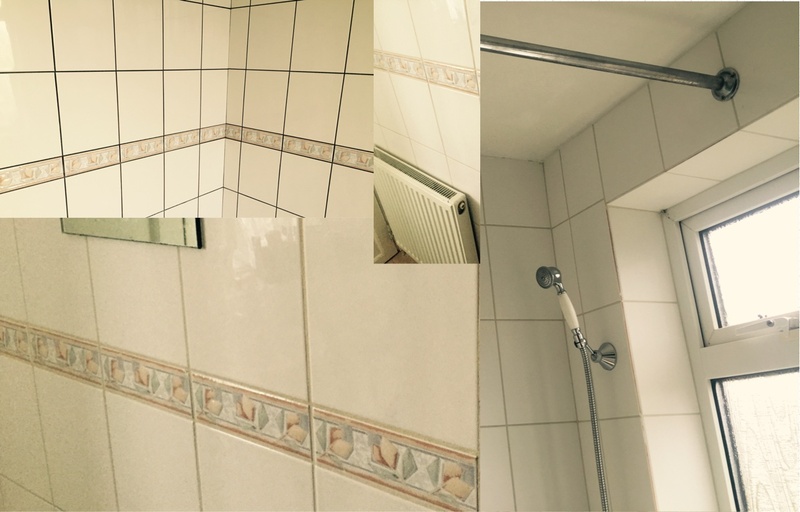 Bathroom tile work and other installations - it is a good idea to refurbish your bathroom every 10 years. 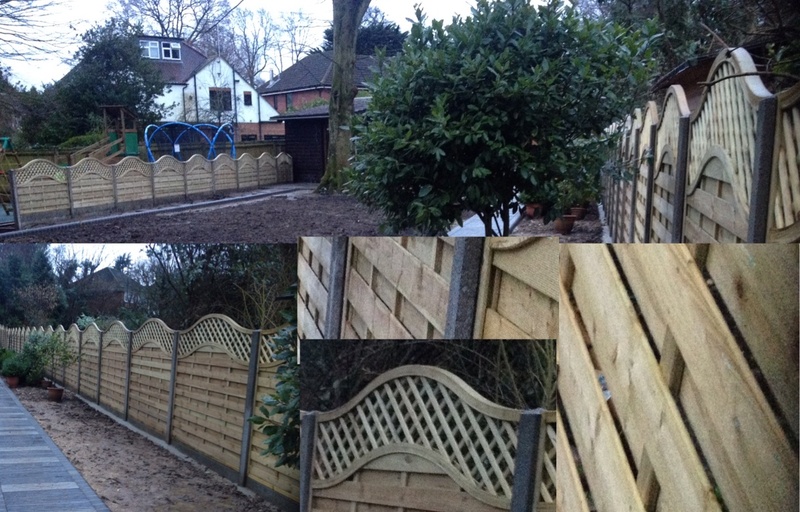 A rich, warm toned wooden privacy fence with layered slats worked with slotted posts and a thin horizontal top panel.